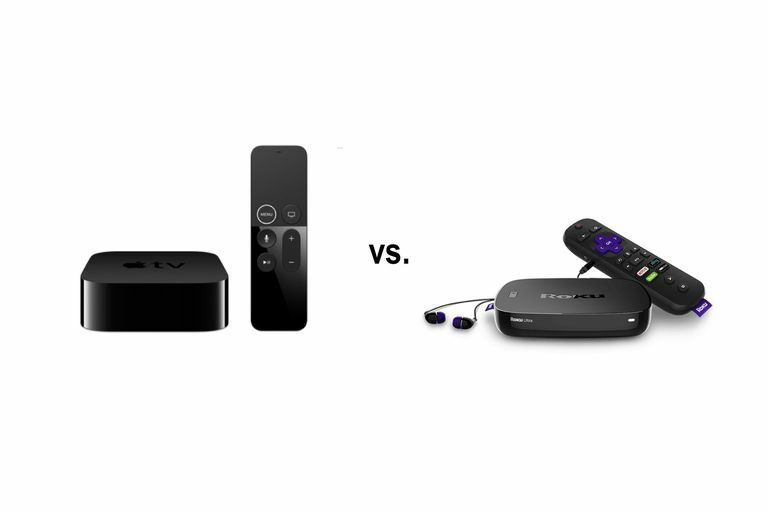 Apple TV vs Roku: Which is Better? Torn between an Apple TV and a Roku? Both are strong digital media players that deliver near-effortless discovery and viewing. Both have created easy, intuitive user experiences that make it easy for anyone in the house to find something to watch. In some ways, the two share more in common than differences. HD video: Both stream video up to 4K to your HD-capable TV through an available HDMI port. Even the least expensive Roku model will stream video at 1080p; but Apple TV 4K and Roku Premiere are both champs at delivering the eye-defying clarity of 4K video. Mobile apps: Both Roku and Apple TV offer full featured apps for finding and playing content. Powerful remote: Apps are great, but in a lot of ways, nothing beats a remote. Apple's slender black glass, plastic and metal remote-as-art-object is just as easy to use as Roku's chunkier, plastic one. But both are powerful tools for navigating through the universe of content that awaits you. It's worth noting that both allow you to use voice search. Massive content libraries: Both Roku and Apple open your TV to a universe of free and premium programming, movies, games and apps. So far, the two are pretty evenly matched. But as you look closer, differences soon begin to emerge that put one ahead of the other. Unleash Your TV's Possibly Hidden Superpower. Switching inputs with your TV remote to get to your Apple TV and Roku content is a drag. Happily, both platforms support HDMI’s CEC protocol, meaning when you start playing a movie or show, the device sends a signal to a compatible TV/monitor to power on and switch inputs to the correct source. Make sure your display is set up to handle HDMI-CEC commands. Apple TV's buttery-smooth set-up experience. No HDMI cable included in the box? It seems like an odd omission for an otherwise premium experience. Buying an Apple TV is easy. Choosing the best model by answering this question: do you have, or will you soon purchase, a TV with 4K HDR? Yes - Buy an Apple TV 4K with either 32 GB or 64 GB of memory space for your movies, shows, and games. No - Buy a standard Apple TV. You have more choices when buying a Roku. In addition to seven different Roku set-top box models, you can choose one of literally hundreds of smart TVs with Roku built in. If you travel frequently, Roku's Streaming Stick is so compact and competitively priced that you may be tempted to pick one up on sale and toss it in your suitcase for travel. When to comes to set up, Apple TV delivers an experience that is as close to "automagic" as any of us are likely to experience in our lifetime. Connect the power cord and an HDMI cord - oddly not included in Apple's tiny white box - and the power cord, then touch your iTunes-connected iPhone to the Apple TV. Wi-Fi settings and Apple ID are both handed off to the new Apple TV unit. Apple TV connects itself to your Wi-Fi network and the iTunes store. Boom. Done. Further, Apple's TV app will handle many of the individual content providers' with a single sign-in once configured. Roku on the other hand has a few more steps to go through, including network connections, setting up a Roku Store account, and individual log-ins for your various channels. Roku's on-screen help makes this a pretty straightforward process. But because it involves more button presses, we have to give this one to Apple TV. You'll pay a premium for this convenience. The standard Apple TV retails for $149 while the 4K versions run $179 and $199 based on the memory configuration you choose. Meanwhile, Roku's most expensive set-top box, the Roku Ultra, retails for $99 though you can frequently find it on sale. In a highly unscientific timed set-up of both units, Apple TV had an episode of American Horror Story up and playing in 15 minutes, while it took the Roku 20 minutes to get from box to broadcast. Apple's plug-and-play advantage takes this one. There's no shortage of content on Roku. With more than 8,700 channels and apps available for Roku, you will be able to find something to watch. Apple TV's 5X4 grid puts 20 channels on a single screen and is a much better use of space. Both units offer Amazon Prime Video. Apple finally added the competing video streaming service in late 2017. Roku's channel icons are square, displaying in a 3X3 grid. You can only see nine tiles at a time, which means a lot of scrolling. Many interesting Roku channels have have just a few shows or videos, and appaears as though the developers have abandoned them. Call it channelrot. Apple TV has fewer channels and apps (approximately 2,000 based on a quick scan of the Apple TV's App Store.) All of the big names are present ... Netflix, Hulu, Amazon Prime Video, all the major broadcast networks, and premium channels. Apple's stricter requirements for developers means that the Apple TV's channels feel more polished than many of those offered by Roku. Many Roku channels appear to have been posted, populated with an initial load of content, then abandoned by their developers. Which is too bad, because there are some real gems in the Roku Channel store with classic, public domain cartoons, obscure Indian cinema, and more. So while most users will be satisfied with the variety of program on either platform, give this one to Roku based on sheer numbers. "Everything everywhere" seems to be Apple TV's mantra. Once you've properly signed in with your Apple ID, all your music, movies, and programs are accessible through your Apple TV, iPhone, iPad, of Macbook. Roku's handling of music and image files with the built-in media player feels clunky. iTunes users, and anyone else who's gone all in on the Apple ecosystem, will appreciate Apple TV's seamless integration between TV and Apple devices. Music, photos, movies, and shows are available on all the screens all the time. The compact set-top box is controlled by either an app or the slender remote that ships with every unit. Meanwhile, Roku universe of media leans heavily into onto your TV screen through a set-top box as well. Navigation through Roku's Channels and Apps is simple thanks to an included remote or the smartphone app. But because Roku is meant to be a video streamer first, the built-in media player feels unfinished, and sort of tacked on as an afterthought. Too, that Roku has to connect to either a USB thumb drive or networked storage to access your media ends up being an inelegant way to manage your music, keep track of playlists, and the like. Chalk this one up to Apple's "everything just works" ecosystem. Whether you use the Apple TV remote, the app on your iPhone, Siri on your Macbook, or Apple's HomeHub, saying "Hey Siri, play Maniac on the Bedroom TV" launches your Apple TV's Netflix app, and the Emma Stone/Jonah Hill mindfreak starts playing wherever you left off. Roku can be connected to your Google Home Mini, Google Home, of Google Home Hub to that giving the same instruction will get the show rolling. Ditto for Alexa and Roku. But what gives Apple the edge here is Apple TV's integration with Homekit. If Cupertino's connectivity suite already handles lighting, cameras, outlets, and other home automation systems, you'll find connecting an Apple TV with the rest of your home automation setup to be simple and straightforward. Roku is the Switzerland of streamers. Clean, well organized, and apparently willing to remain neutral in the Apple v. Android debate, Roku's easy Android screen mirroring and native app make it hard to beat. If you own an Apple TV and half the people in your home use Android devices, they'll need to rely on the Apple remote for control. And forego screen mirroring. If you carry a lot of content on your Android device, or if you want to control what you watch with your Android phone, Roku's really the only game in town. While there are apps available on the Google Play store that offer workarounds to controlling an Apple TV with your Android device, none of them will feel as intuitive as Apple's native Remote and TV apps. Roku also allows screen mirroring, making it simple to stream whatever's on your Android phone or tablet to the big screen. Apple TV and your iPhone/iPad will connect via Airplay, but trying to get your iPhone's content to play on a Roku requires a third-party app which may deliver less-than-awesome results. For its hard-to-beat combination of easy connection, native smartphone apps, polished user interface, and seamless connection between streaming and owned content, the Apple TV wins. And if Apple and Android ever learn to play nicely together, the Apple TV could become the one box to own.